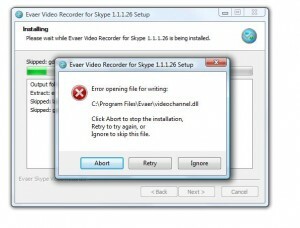 How to upgrade Evaer video recorder for Skype? 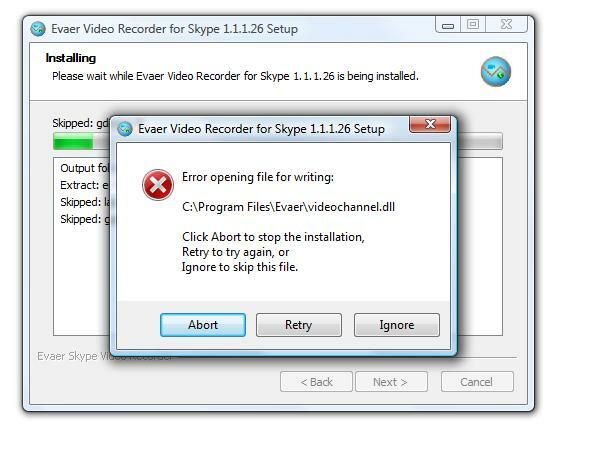 Some users got the following error message when upgrade to the new version Evaer video recorder for Skype. Please follow these steps to successfully complete the upgrade. 1, Download the latest version from the download page. 2, Exit the Evaer and Skype if they are running (please click your windows notify bar to exit Evaer if there exist it). and open your taskmanager to kill the process “videochannel.exe” if there exist it. 3, Click windows menu Start > All Programs > Evaer > Uninstall to uninstall old version Evaer video recorder (Your recorded files/configuration will not be removed). 4, Please open the Evaer installation directory to check is there exist any files , delete these files if exist. 5, Run the New version Evaer setup file to start the upgrade. This entry was posted in Skype Video Recorder and tagged upgrade Evaer, upgrade skype video recorder on May 2, 2011 by admin.